Moment isn’t a massive case company but they are quite popular among the photography niche community. They also sell battery and wallet cases, but it’s their unique photo cases with detachable lenses that put them on the map. As they are a relatively small company their inventory selection isn’t very big. They have stuck with big brands like Apple, Samsung, and recently Google, but now they are launching a photo case for the OnePlus 6 (with expected shipping dates for pre-orders being today, December 12th), and they have one for the OnePlus 6T already in the works as well. Now, most of you have likely already seen these attachable lenses on sale at places like eBay, Aliexpress, and Amazon. These are incredibly cheap and usually meant to be universal so they can attach themselves onto any smartphone. The lenses usually come in threes, including macro, fisheye, and wide-angle, and generally, the results may vary. Moment has really excelled in this market in a way that no other company has been able to do. Instead of using cheap clip-on lenses, they create custom cases that fit specific devices. Moment offers various lenses including wide 18mm, telephoto 58mm, anamorphic, macro, super fisheye, and a 60mm telephoto option. These aren’t cheap $5 lenses either with some costing as much as $150. But as the saying goes, you get what you pay for, so Moment is offering high-quality lenses for high-quality cases and a plethora of other accessories such as filters, gimbals, tripods, and more. Again, the company has been very picky when it comes to which devices they offer their products for but now they are bringing OnePlus into the fold. 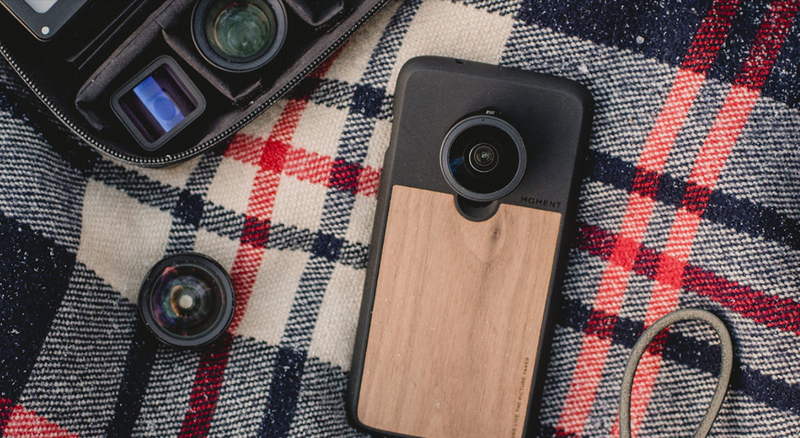 The OnePlus 6 photo case is available in Walnut Wood or Black Canvas with both options costing $30. Lenses (sold separately) start at $89.99.